Spoons is a modern Nigerian Restaurant & bar combines the buzzy conviviality of the African dinning with bold interior design. Welcome to Spoons, where a Spoon is more than just a spoon. As our name suggests, a heap of spoon is the beginning of a journey that pushes the art of food flavoring to it very limits, this is why we are very passionate about the food we cook. We therefore, exercise patience when preparing every dish on our menu. 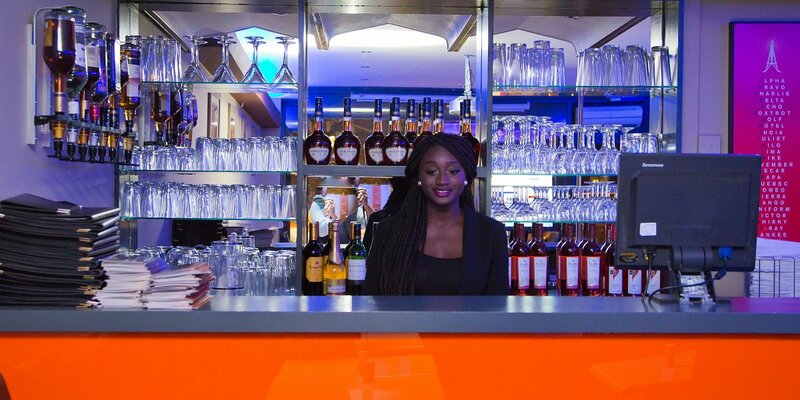 Spoons Restaurant is an African eatery serving freshly cooked Nigerian Cuisine in a vibrant setting that reflects the country’s rich culture, with original art and artefacts. Spoons pride itself on giving diners excellent service and a true traditional hospitality where a smile goes a long way. Our Menu reflects the high diversity of dishes from Nigeria. Our focus is on well-sourced and freshly cooked ingredients. At Spoons you will be welcomed and served by friendly and efficient staff, in an atmosphere that is comfortable and relaxed. A mixture of modern and traditional ambiance, West African crafts displayed around which gives Spoons a traditional feel, while the fragrant aromas, dusky lighting and a mixture of Jazz with West African music creates at atmospheric dining environment away from the hustle and bustle of daily life. A fully licensed and air conditioned restaurant with a chill-out bar area serving all types of drink and cocktails to quench your thirst. We are continuously working hard to improve the quality of our food and the level of service provided. We always listen to our customers and their recommendations as this has been the key to the success of our business. We strive to meet our customer’s needs by going beyond expectations. Spoons proudly boast itself as different from other Nigerian restaurants by offering services such; free Wifi for our customers, customer loyalty card and stress *FREE delivery service (terms & Conditions applies) for customers to enjoy our food from the comfort of their home. To keep our customers entertained, we also offer live music every Friday Nights to help release the pressure of busy working London life. Our aim is to offer a great quality dining experience in relaxed, comfortable and informal surroundings. At the heart of what we want to achieve is value for money and quality…somewhere you can relax, and enjoy the night away.